I’m a Montana native, so if you ask me my favorite small town, hands down, it would be Philipsburg, or “Pburg”, as the locals call this little hamlet. 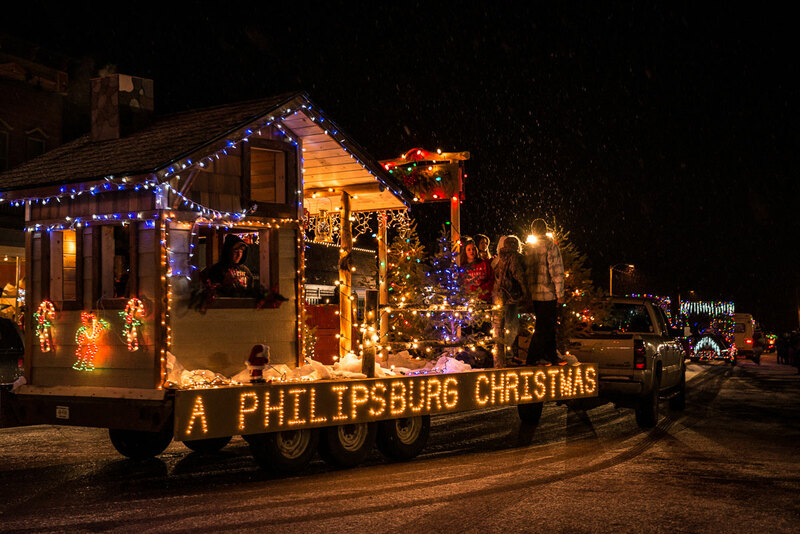 Philipsburg sits alongside Hwy 1, also known as the Pintler Veterans Memorial Scenic Highway. Starting from Anaconda and ending in Drummond (the anchor towns), this 64 mile stretch of road winds past Georgetown Lake and opens up into the Flint Creek Valley. Rolling hills, pastoral farmland, the meandering Flint Creek and a scattering of historic barns make for a beautiful drive. 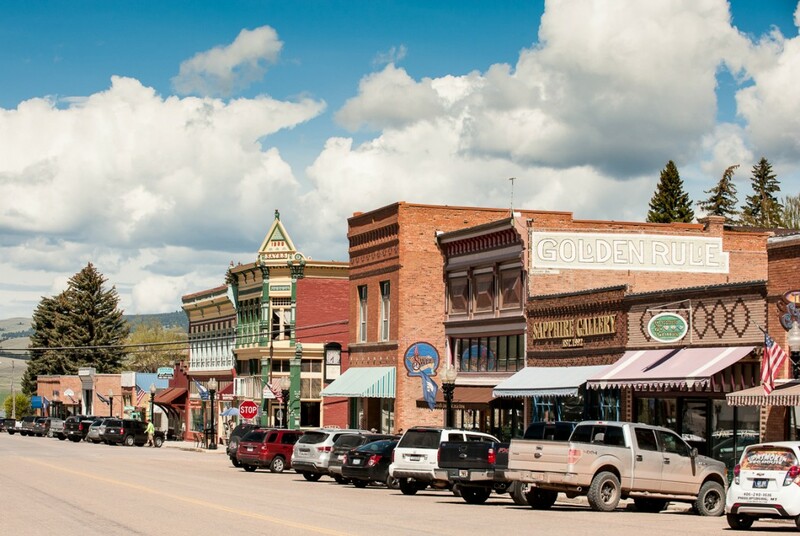 Like many of Montana’s cities and towns, Pburg sprung up as a result of mining back in the late 1800s, in this case silver in the mountains that are now part of the Beaverhead Deerlodge National Forest. The town is named after Philip Deidesheimer who was involved with mining in the area. Four miles up a dirt road behind town is Granite Ghost Town State Park, the original site of what was once the richest silver mine on earth in the late 1800s. In its heyday, 3,000 miners worked in Granite; today Pburg, just down the hill, has a population of around 1,000. 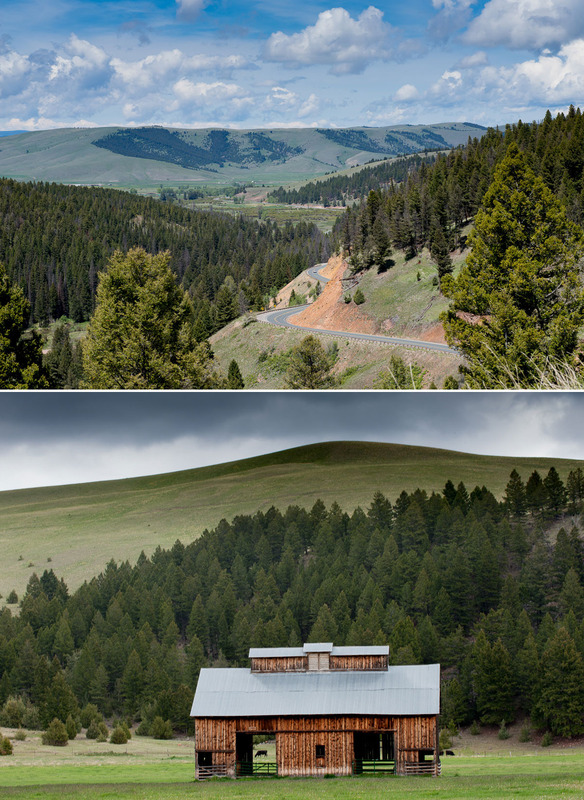 It’s a good lesson in Montana’s history to take the short drive in the warm season to explore the site. 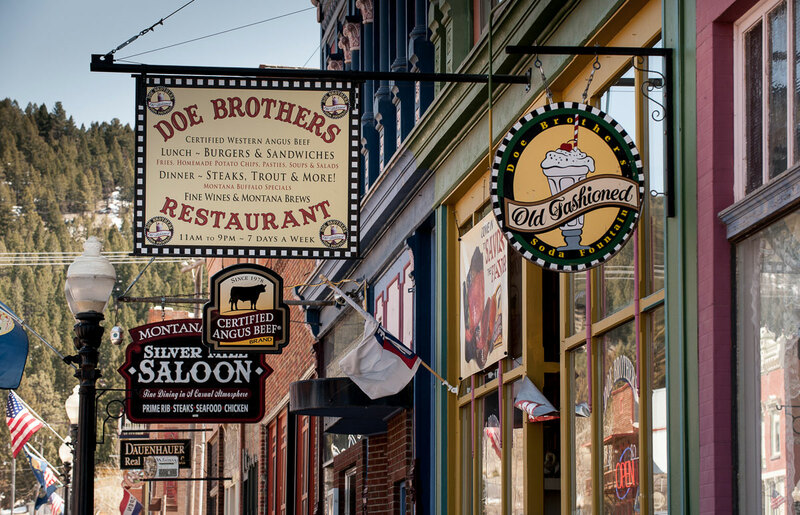 When you pull into Philipsburg, it doesn’t look like much – a hodgepodge of many older homes scattered about, but continue to the heart of town, Broadway Street, and you’ll be transfixed by what the locals have done – repurposed, repainted, and refurbished these historical buildings that are ripe for exploring. It’s no surprise that Philipsburg won the 2015 Sunset Magazine Award for “Best Municipal Makeover,” beating out entrants that included Reno, Nevada and Sacramento, California. Park the car – time to stroll! First stop should be The Sweet Palace, floor to ceiling full of over 1,000 kinds of candy, including their signature salt water taffy. Last year folks from 56 countries and all 50 states stopped by. Next door is the Sapphire Gallery, where you can purchase a bag of gravel and sift through it for sapphires. You always, always fine them – often times gems big enough to have heat treated and made into all kinds of jewelry. Montana Gems of Philipsburg also on Broadway offers a similar service. There are several one-off combo gift shops with a mix of vintage, local art, home décor, and clothing. If your sweet tooth is still aching for more, head to Doe Brothers with its classic old fashioned soda fountain and try a huckleberry shake. If you need a coffee refuel while on your walkabout, head to the Daily Grind. For history buffs, plan a visit to the Granite County Museum; as you would suspect, it’s brimming with early mining day and ghost town history of this area. Did I mention there is professional theatre during the summer months at the Opera House Theatre, the oldest operating theater in Montana? While Philipsburg sees its share of visitors who stop for a few hours, I heartily advocate spending the night and soaking up small town ambiance. There is a handful of B&B’s, including the Broadway Hotel, Kaiser House Lodging, Quigley’s B&B and The Sanctuary, a repurposed Presbyterian church. 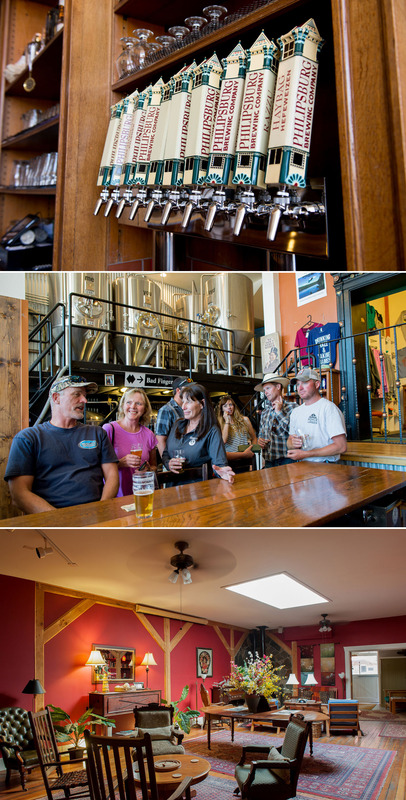 First stop on the evening agenda should be the Philipsburg Brewery, where it’s easy to fall into conversation with the locals, including area ranchers, to visit over such key topics as the price of cattle and wheat, weather forecasts, etc. Cap the evening with fine dining at the Silver Mill Restaurant, or opt for something faster at Friday Night Pizza, next door to the laundromat and car wash. If the alluring smell of barbecue is in the air, it’s coming from Upnsmokin BBQ House – another great dining option. Pburg serves as a convenient base camp for nearby outdoor recreation. Smack dab in the middle of town you have Winninghoff Park Ice Rink (NHL-sized) just a block off Broadway. Nearby Rock Creek is a favorite with fly fishermen; get the scoop on where the fish are biting at Flint Creek Outdoors in town. Or treat yourself to a guided flyfishing trip. Discovery Basin Ski Area is a 40 minute drive. Georgetown Lake sees the typical boaters and fishermen in the warm season, but transforms to an ice fishing mecca come winter. 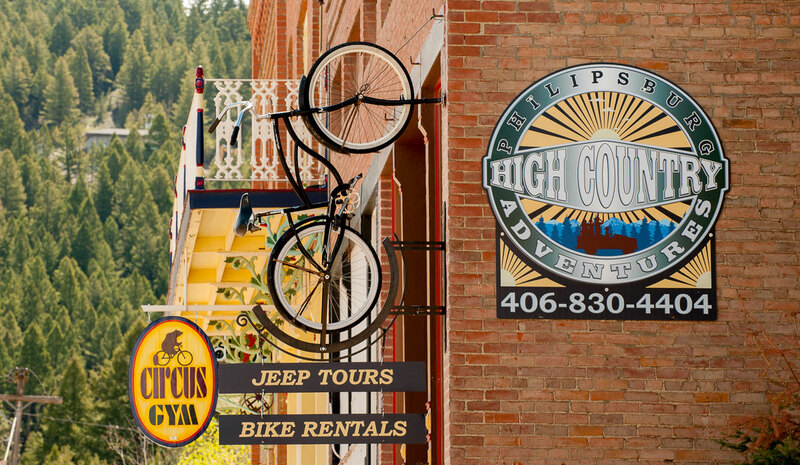 Philipsburg High Country Adventures is a new offering – with bike rentals and 4×4 jeep tours – what a great way to get into the heart of the ghost town scene! My most memorable visit to Philipsburg happened last December when I booked a room at the Broadway Hotel to take in Yule Night. The town had dressed up for the holidays – wreaths circled in Christmas lights hung from all the lampposts. But the weather was uncooperative – mostly a sleeting, bone-chilling rain. That didn’t stop the locals from having their parade of lights – all seven entries that circled the two blocks twice, stretching the parade out to a full 20 minutes! Every business on Broadway was open, serving hot spiced wine, cocoa or apple cider, along with cookies, dips, hors d’oeuvres – etc. A few fire pits were set up to help keep the chill off. Everyone knew everyone – merriment and laughter was the order of the evening. Everything about this night felt right with the world – the comradery of families and friends who clearly know how to appreciate life in a small tight knit community, where neighbors look after neighbors. I’m thinking I might retire here one of these days and dip chocolates at the Sweet Palace! Donnie has been with the Montana Office of Tourism since 1990. For the last ten years, she has split her time between working with travel journalists and photographing anything and everything that lures people to visit our great state. Her unquenchable passion for photography and travel has shaped her life, with the Far East being among her favorite destinations to explore. Home base is Helena for this wife and mother of two sons. Donnie's work has been published in Sunset, National Geographic Traveler, Horizon Air, Delta Sky Magazine and Via, as well as several Montana newspapers and magazines. 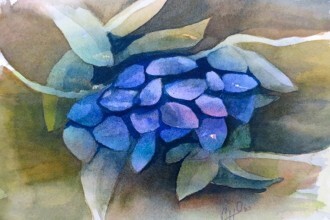 Check out her work at donniesexton.com. You forgot the White Front!!!! Thanks for the tip! I’ve never been but will hit it this winter. Nice article. I’ve lived in Philipsburg since 1997 and wouldn’t live anywhere else. Would just like to point out that you missed mentioning one little gem in our town — Grassroots Gallery, which is full of talented work from local and regional Montana artists. Hope you get a chance to stop in next time you are in town. Thank you. Donnie loves Pburg! And so do we at TLBP. This gallery sounds incredible. Thanks for telling us about it! Really love your page on P-burg. My aunt and uncle would keep me many a summer and I even went to the high school there for a short period, had a even shorter job as a waitress in the Cafe next to the Silver Dollar, no longer in existence, nor the the soda shoppe I frequented as a teenager. My uncle George McKee owned the Silver Dollar Tavern and my aunt Connie was such a love. It was a bit different in the late forties early fifties but the photo’s never-the-less the photo’s are quite nostalgic. I don’t get back as often as I would like the last time being with my sister Jude Welter. We stayed at the Quigley House, a wonderful experience, Dave and Davee being such gracious hosts. Love hearing your stories about this cool little town. What a fun place to get to spend summers as a kid! Am going to Google Qugley House! I have found so many interesting little places to stay (many above downtown businesses). Also an inn in a former church that caters to motorcycle enthusiasts. Thanks! Thanks so much for all the Inside Tips! It’s so great when our readers share their local knowledge, making us aware all all the cool little gems waiting to be discovered in every little town. Keep the advice coming! Donnie’s post is just a “nibble”/one of many we’ll be doing on Pburg. Donnie (and other Contributors) will be going back to dig into specific businesses. We’ll definitely check these places out! Thanks again. I love this article! I lived there for 5 years and so miss it and the wonderful people. Forgot to mention the Montana Law Enforcement Museum. Thanks for the tip, Ken! We love small town museums. Lived there, loved it, miss it. Hello to all my friends in the Burg.